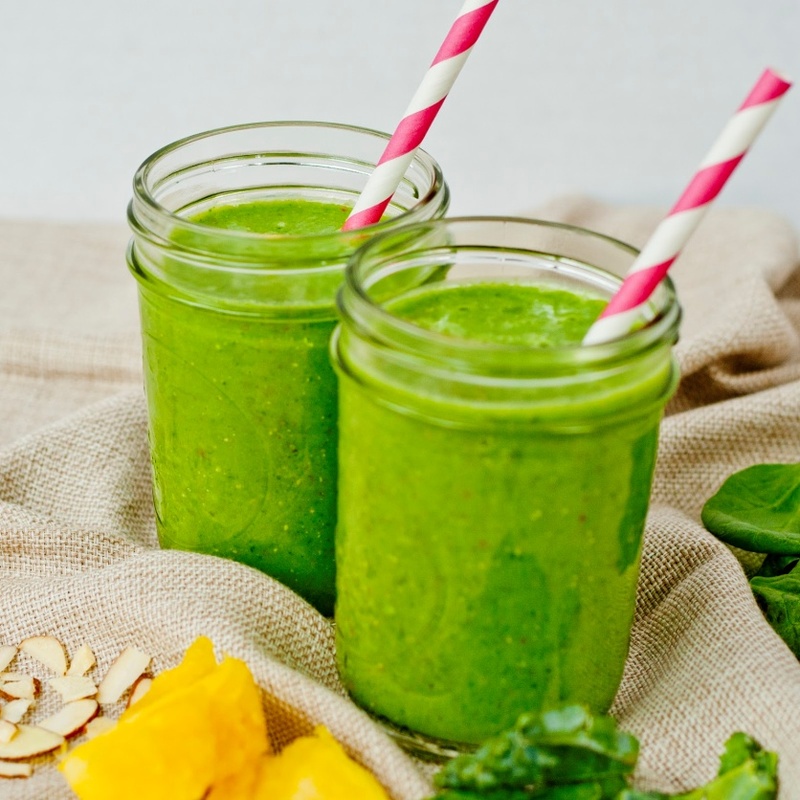 If you’re a fan of green smoothies, then here’s some information to save you time and energy with the business of green-smoothie-making. It’s from a terrific site, Live Simply (www.livesimply.me). Even though smoothies are a favorite way to start the day, on occasion there’s not the time to indulge in preparing this healthy breakfast. That common dilemma is what makes Live Simply so invaluable. Kristin, owner and editor of this truly helpful site, came up with the solution to this lack-of-time issue. Here’s the deal: Not only do we not always have the time the process takes, it also just gets tiring having to pull out several different bags and containers from the fridge and freezer, washing the fruit, then cutting it up, etc. Kristin’s solution? 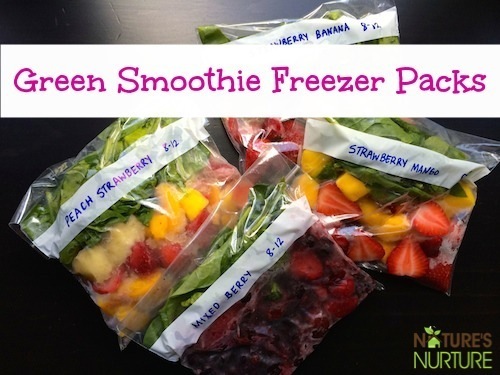 Green Smoothie Freezer Packs. 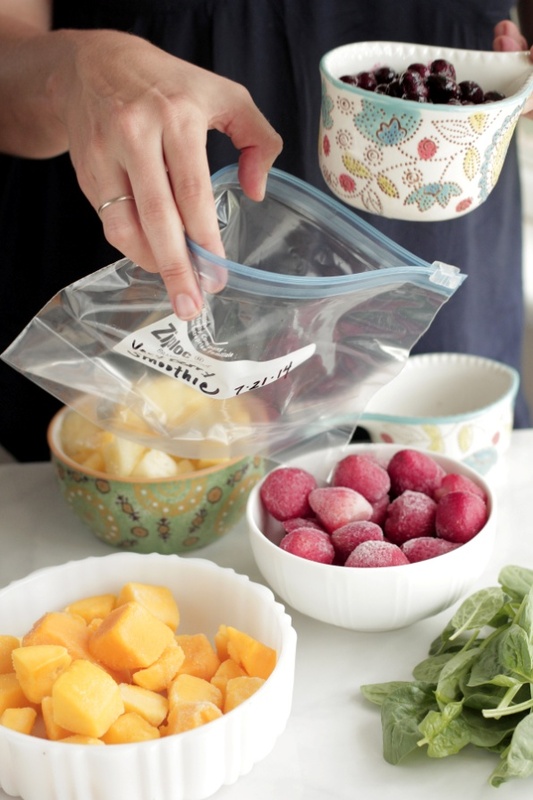 The premise: To make things easier, do your smoothie prep work all at once, ahead of time. That way, making a nutritious green smoothie every morning is as easy as dumping a freezer pack into the blender and flipping a switch! I confess I’d never thought of this (duh). 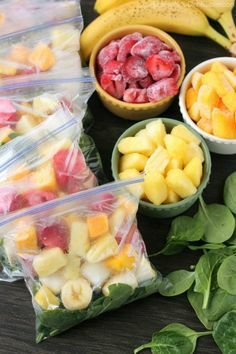 GENERAL INSTRUCTIONS: In labeled plastic zippered freezer bags, combine the ingredients for each smoothie except the liquid. Keep bags in the freezer. To use a freezer pack, add 1 cup liquid to the base of the blender followed by smoothie pack contents and any extras such as chia or flax seeds, gogi berries, cacao powder, etc. Blend until smooth. Note: Add 1 cup of greens to any smoothie pack before freezing for added nutrients. 1. They’re a natural energy booster; count on them to keep a little pep in your step in the morning (and during those afternoon slumps). 2. They’re a natural weight loss help; this is just a happy side effect of gulping these in place of a typical breakfast (when you make sure to include healthy fats and protein to make it a more complete meal). 3. They’re an immune-booster and will help you stay healthy all-year-long. And when you’re feeling under the weather, turn to a green smoothie along with your chicken soup! 4. They’re packed with disease-fighting antioxidants. The phyto-nutrients in leafy greens boost your body’s immune system and keep it functioning properly. 5. They’re the best food—hands down. It takes less than 5 minutes to make a green smoothie (and clean up!) and they’re super easy to take on the go– especially when you prep ahead. I’ll end with another valuable piece of information. 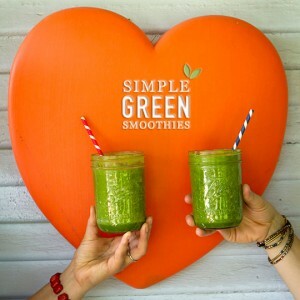 The girls at Simple Green Smoothies did the smoothie-beginner a favor. 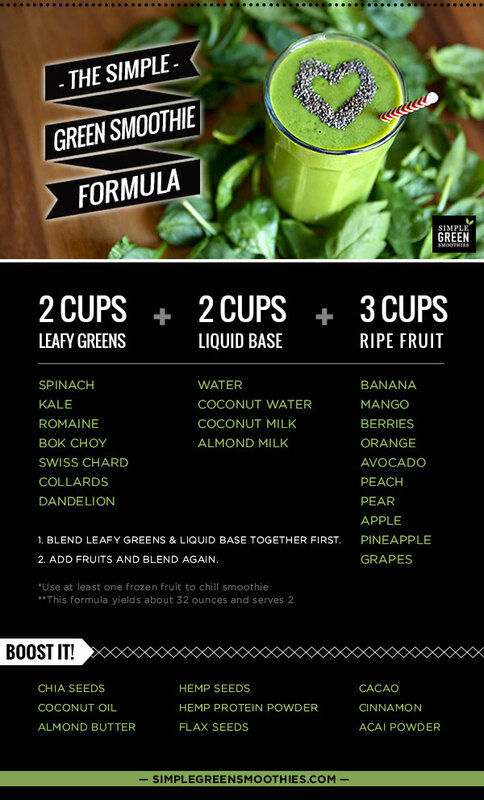 They share their beginner-friendly formula making the majority of their delicious green smoothie recipes. I wish I’d had this information years ago when I started making smoothies. I came up with some real barfers. But you novices out there can avoid that trial and error stuff, thanks to the generosity of the Simple Green Smoothie folks. Here’s the magic formula, and meanwhile, let’s go make those smoothie packs so we can save some time and energy!